Inspired by the wild and pure essence of Mani, Ariá Estate reflects a calming, respectful and attentive hospitality philosophy which is visible in every curated detail of a gracious stay: the skillfully designed Suites, the comfortable light filled indoor spaces, the mesmerizing landscape, the breathtaking sea views and glorious sunsets, the creative gastronomy and the luxurious Zen spa, are ideal for guests that cherish the privacy of authentic high living. In an atmosphere of casual elegance, Ariá Estate Suites & Spa is the brand new 4 stars leading hotel in Mani, designed to offer the comfort of a private home, combined with exclusive, upscale hotel amenities and services. Created to inspire memorable experiences to our guests; Ariá Estate is a place to relax, unwind and rejuvenate, indulging in the unpretentious luxury and cultured blend of people, services and ambience. Awaken the senses and allow the light-filled landscape and the -invitingly close- magical blue waters of the Bay nourish your spirit… Find refuge and relaxation in the lavish Estate hideaways, enjoying romantic or family times in the privacy of worry-free leisure. “In Mani, our fatherland, we used to return every summer to enjoy our vacation in the pure warmth of a nonchalant place where only simple things mattered. Many times, we invited our friends to spend those precious moments with us, and we always needed more space. Then, during a family walk down the path from Areopoli to the sea, we reached the area where our ancestors used to grow their wheat and olive trees, and rested under the oak (ariá) trees; that place is called Hariá, and this was the perfect spot to create a unique place for our guests”. Faithful to the spirit of a welcoming hospitality heritage, Ariá Estate Suites & Spa was created within a beautiful and protected landscape, infused by natural and archaeological traces –like the prehistoric cave of Apidima- that go back in time revealing a rich history of local narration. 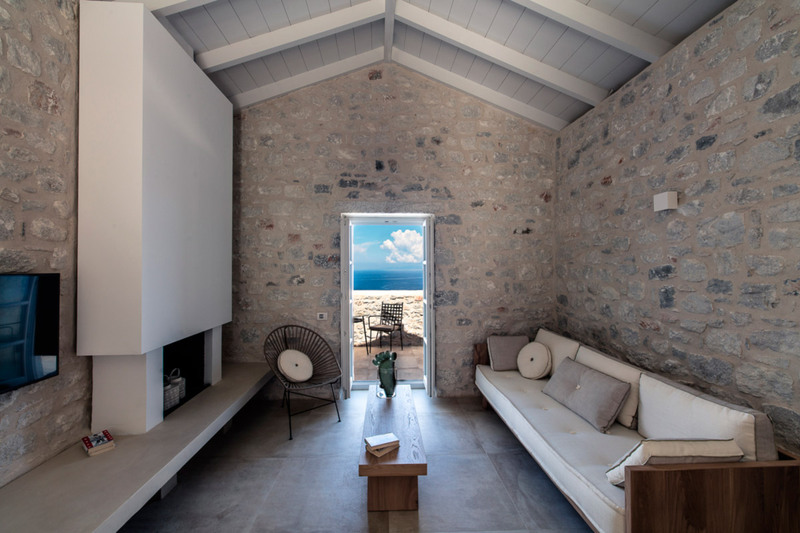 Brilliantly located on a hillside overlooking the sea and the Messinian Bay that stands between Limeni and the Diros Cave landmark, Ariá Estate Suites & Spa is honouring the pure and rugged beauty of Mani, providing a raven of relaxation and enjoyment. Respecting the architectural tradition of Mani and featuring a sustainable character, we used natural materials, local stones and building techniques in dialogue with the unique landscape that surrounds the Estate. Every detail of the property reflects the calming local palette and embraces authentic customized design, creating a feeling of comfort and serenity. The 16 luxurious sea view Suites, are built amphitheatrically in three unique property alignments, offering the privilege of undisturbed, birds-eye sea and romantic sunset views, as well as the protection of privacy. Each one of the Suites is a unique creative project with tailor-made design elements and personalized details, combined with high-end, contemporary luxurious features. Underlining the singularity of Mani, we shaped an authentic living experience for our guests.